This is a Cigarette Box. It is dated 1934 and we acquired it in 2015. Its medium is copper and cedar. It is a part of the Product Design and Decorative Arts department. Chase Brass and Copper’s shift in identity and production from an industrial manufacturer of plumbing and roofing supplies to a supplier of novelty gift items during the Depression marks the impact of the economic climate on design and industry in the 1930s. As the company’s revenues dropped due to a lag in new home construction and renovation, Rodney Chase, then Direct of Public and Industrial Relations, devised a line of novelty items that would generate income and keep their factory operational. Chase Brass and Copper commissioned Albert Reimann to design some of the first homewares out of their existing industrial supplies. The company later invited the expertise of Erik Magnussen, Walter Von Nessen, Russel Wright, Lurelle Guild and Ruth Gerth, many of whom, in Reimann’s shadow, showed an affinity for progressive German design. 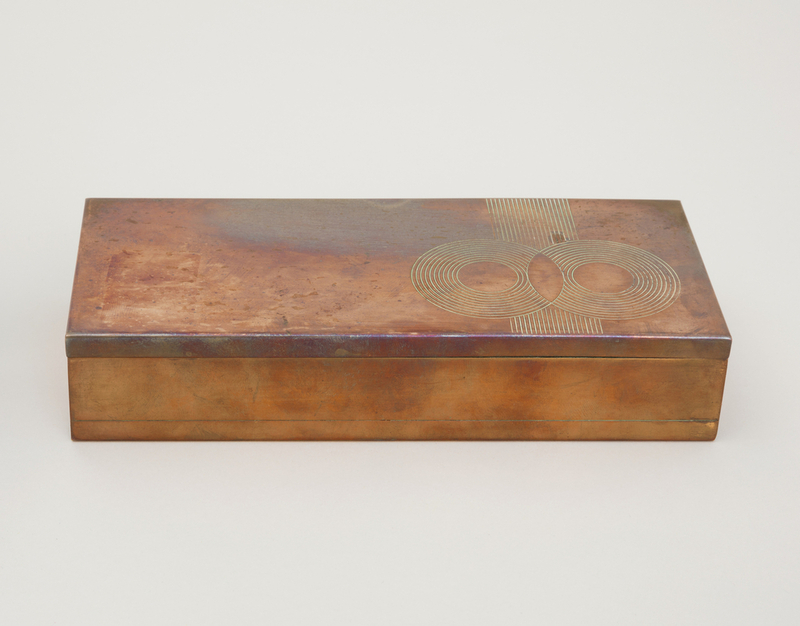 Ruth Gerth received praise for her abilities in “changing the commonplace into the beautiful” and “designing new forms.” Using sheets of copper previously molded for industrial uses such as water tubing, Gerth fashioned a slim rectangular cigarette box with incised decoration of a column and two orbs whose dense parallel lines and intersection afford a sense of motion. The absolute precision of this decoration’s detail suggests the efficiency of the machine that made it. Marketed as “The Connoisseur” this cigarette box was one of a number of smoking accessories that Chase produced to cater to the vice’s social popularity. Virginia Pope, “Craftsmen Find a Patron in Industry,” The New York Times, August 21, 1932, SM12. 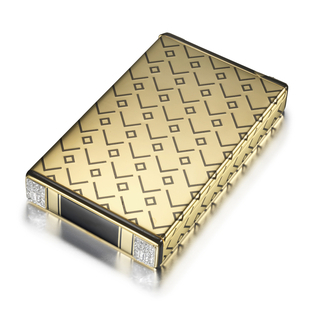 enamel, rose-cut and baguette diamonds, gold, platinum.